Visit COTrip for weekly travel impact information. Crews on this project will build an Express Lane in each direction along this 6-mile segment of I-25. This addition will increase mobility and travel choice along this busy stretch of highway connecting downtown Denver to major growth in northern Colorado. install tolling infrastructure for the new Express Lanes. Beginning in Summer 2016, CDOT and Hamon Infrastructure built Express Lanes from 120th Avenue to Northwest Parkway/E-470. In August 2011, CDOT completed a Final Environmental Impact Statement (FEIS) that includes the North I-25 corridor between US 36 and Colorado Highway 7—one of the most congested stretches of highway in the Denver metro area. This stretch sees an average daily traffic volume of 174,000 vehicles per day. The FEIS identified a preferred alternative for this corridor, which will offer increased safety, capacity and user choice. two-lane closures in both directions of I-25. intermittent daytime shoulder closures on I-25. a speed limit reduction to 55 mph. traffic switches and narrowed lanes. Add capacity and ultimately provide the choice of a reliable trip with the addition of one HOV/Express Lane in both directions. 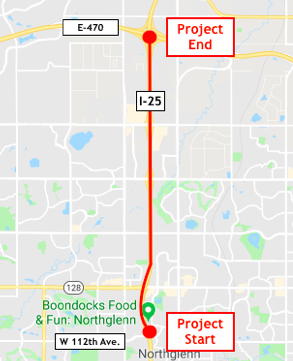 Install an auxiliary lane along northbound I-25 to connect the 136th Avenue on-ramp to the 144th Avenue off-ramp, which will help drivers merge more comfortably between the two interchanges. Improve driving conditions by resurfacing the roadway. Express Lanes increase roadway capacity and help manage congestion on Colorado highways by adding lanes that provide a new choice to drivers. Motorists can choose to ride the bus, carpool or pay a toll to use the new Express Lanes as an alternative to the free, general purpose lanes.